A comparison of three tier 7 destroyers, 2 premium and 1 tech tree. All based upon British designs from the 1930s, the Tribal class for Cossack, the N class for Gadjah Mada, and the Grom class for Błyskawica. Why do this comparison? 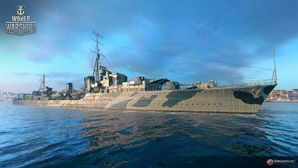 Namely because Cossack is enduring much bad press among reviewers, but also because there is a great deal of confusion (for example the mistaken belief that Cossack and Gadjah Mada are the same class of dd) about the upcoming premium, and because a review of her base World of Warships WIKI stats offer us a platform on which to base a more credible opinion of her potential, in game, and what we might fairly expect, and what would be unreasonable. Of course, this statistical comparison is limited, by both a lack of comprehensive data for Cossack, and because real in game experience and feedback can and does give a very different impression, as shown by recent Youtube and forum reviews by those who have actually played her in game, in random battles. As for my recent comparison of Aigle (release) and T61 (WIP), I shall begin with a study of their comparative survivability, (how much hurt they can avoid/take) before looking at how much hurt they can potentially deliver to the enemy. It is important to note, Grom class Błyskawica was ordered and laid down in 1934, the first Tribal (of which Cossack) class were ordered and laid down in 1936, the first N Class (of which Gadjah Mada's sisterships) were ordered and laid down in 1937. The N Class were conceived as improvements upon the Tribals, they were smaller, did have better gun arcs, but.. they paid for this with poorer sea keeping and greater vulnerability to flooding and engine failure. It remains to be seen if such as these characteristic but subtle differences are carried through in game. Guns AP Krupp Penetration values (to be considered in conjunction with shell speed) Many of you will also question, are AP values really important for a dd!? Survivability, who wins? This is not a simple thing to judge, GM cannot not afford to absorb very much dmg, and is a very fragile boat, but she is extremely agile (turning radius and power to weight). As from this update, screencaptures of armour models for all 3 ships clearly favour Cossack. Damage output (on paper, with only wiki stats as a reference, it is too close to call a winner, my personal subjective view is that the N Class destroyer, Gadjah Mada, wins this round, by a whisker, but if Cossack is handicapped by a 1x4 tube layout, GM is not able to use her torpedos against other destroyers). Gadjah Mada - Nowhere near as bad, or terrible, foreward firing but she pays for this with awful rearward firing arcs. Below, the clutter right in front of Cossack's aft turret (circled) offers an added explanation for the very poor angles of fire. Updated following comment by by LWM. One wonders if in practice, a clever sailor wouldn't have cut away some of that nonsense, (just a little bit)! Three destroyers, designed and built in the same country in the same era, all three for very demanding clients. The Tribal Class (Cossack), must have learnt lessons from the Grom Class (Blyz), as the N Class (Gadjah Mada) tried to improve on the earlier Tribals. They share, apart the torpedos, very similar equipement, so what will distinguish Cossack in game? As a premium, does she deserve to be better than the later, N Class Gadjah Mada (a tech tree ship)? Blyz has some very fine guns, but only 3 up front, and they are slow firing. All three have terrible angles of fire (a British habit), Cossack's angles of fire are indisputably the worst, but Cossack's armour is equally, the best of all three. i will be updating and refiining this during the weekend. Comments welcome! Someone had to write the minority opinion I will await the do-overs for this ship with interest, and I would fight a (sensibly-constructed) campaign for the Cossack regardless. This comparison is timely, especially for those considering a mid tier DD purchase shortly. I'm really surprised how the Błyskawica stacked up, I always considered it a gudbote, and the Cossack would appear to be the same. I want to like the Cossack and having read the arguments for its current state, I'd have to say I'd prefer historical "hurt ™" stats. I think that concealment makes a difference. I spec my Blys as a pure gunboat, so AFT, BFT, DE, etc. AFT is not something that other players lightly choose to add to their dd's. I would tend to think that most GM players wouldn't pick AFT, for example. That difference in range means a lot in a later game fight. I think you're using the stock hull values for Gadjah's HP - should be 14,300. She also gets a 3.5s rudder shift on the top hull. Gadjah's top torps reload in 120s not 131s. You're using a mix of top and stock hull values on Gadjah. 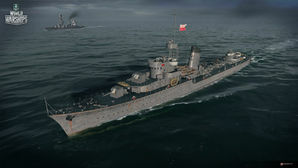 On the wiki click the 'top' button above General stats and below the pic of the ship and the silhouettes of the 3 ships. Would like to see a similar comparison between the Farragut and Monaghan at some point, as I still don't see the point of the latter. Based on initial stats, she doesn't seem to have any significant performance changes to justify a purchase. J, K, and N class DDs were built with longitudinal framing. The Tribals and Bylskawica used transverse framing, which is less resistant to damage. This is not considered in the game. Won't change much either IMHO. Cossack was a reply to the Fubukis, and Tribals are pure gunboats pretty much, even with those torps. Gonna free XP to Gadjah Mada and see what works, even with the deep torps. Being an RN fan, I play that line to get a better feel for RN-type DDs more than anything else. Missing a very, very important key factor. Armament rotation limit. All the ROF in the world doesn't do you any good if you physically can't get your guns to aim at your target, and it's a lot more fun fighting the red team than your own ship. Also worth throwing out (someone observed that Blyska looked bad) that the Polish destroyer may have a British hull, but she has the Swedish Bofors 120mm/50 gun, rather than the 4.7in/45 of the Cossack, Gadjah and Gallant. The British shells take 9.43s to reach 10km, the Blyska's just 6.7 - that's 40% longer, 40% more lead needed, 40% more target dodge time. This is a huge unwritten advantage. Blyska can run and gun at range, Gadjah and Cossack use a 4.7in projectile designed around WWI and only slightly modernized, firing from a 45 rather than 50 caliber barrel. Exactly. 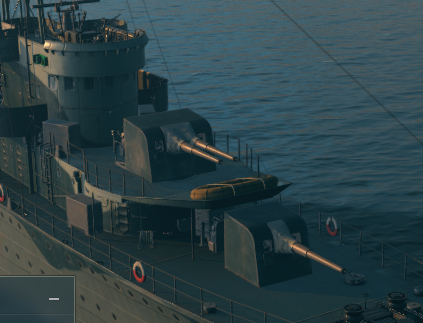 Blyskawica is such a comfortable gun boat because it has the armament angles to get all guns firing while the hull is at all sorts of angles, and the ballistics to put warheads on foreheads. And to top it off she has amazing gun range, speed etc. Only thing that would make her more OP, if she had 139s instead of 120s. She still rates as my fav gunboat. Once I learned how to use Kiev and Tashkent, I turned around and used that on Blys and wow did my dmg per game jump. And yes I still use IEHE on Blys and it for me was still the right call. on the other hand having guns whose ballistic arc is higher means you can be closer to and fire over things that provide cover, because ships with flatter arcs cannot hit you while you can hit them. Just yesterday I watched a DD hide behind a BB all while firing his guns over the top. I was was trying to hit him with my cruiser guns, just needed one hit to finish him off and he was able to slip away as the BB went behind an island. The N Class were conceived as improvements upon the Tribals, they were smaller, did have better gun arcs, but.. they paid for this with poorer sea keeping and greater vulnerability to flooding and engine failure. 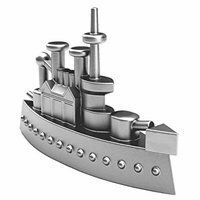 Tribal was designed to plug a cruiser shortage created by the London treaty. Main roles included detached cruiser duties, attacking other destroyers and scouting. Not massed torpedo attacks agasint enemy fleets. Grom-class was a large destroyer leader design that was still expected to carry out torpedo attacks on fleets and didn't have command and control associated with cruisers or Tribals. I'll look into that, need a quiet morning. This I do mention Lert, as a limitation of this comparison, I do not pretend it (the comparison) to be comprehensive, limited, as is, to publically available WIKI data, and do advise this comparison to be conditioned by feedback/statements from reviewers who have played Cossack on ST (such as NoZoup/LWM/Vulgarr and others). Hmm, I'll have to recheck all the Gadjah stats, thanks for the heads up! Will update this post once, done. 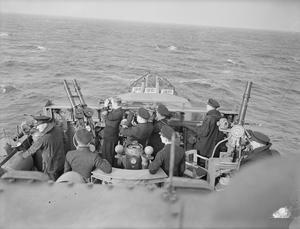 Of course, the chronology and new, successive design features of each class speak of a learning process, which is natural given the centralized oversight of warship design in the UK of that period (including of export designs such as Blyz), some of these features more successful than others. The J/K/Ns incorporated some radical ideas, some of which simplified operational maintenance and improved reliability, but they also introduced greater vulnerability to taking catastrophic damage (machinery). Almost all UK designed and built dds of the 1930s can trace their heritage/DNA to HMS Amazon, a dd design of the early 1920s, and a fine heritage it was too. major update, corrections and exclusive armour scheme screencaps of Cossack! (I exaggerate, but what's new?) Cossack's armour scheme revealed as much tankier than her rivals, Blyz and Gadjah Mada! Courtesy of dseehafer and GM3D. 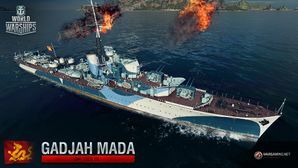 Gadjah Mada is superb, although limited firing astern if you meet a DD head on you can put 6/6 guns on target at 11', or sit in smoke presenting a tiny profile to torpedoes. Cossack's is terrible. Her aft arcs are similar to Gadjah (better on B turret, similar on A) but her forward arcs are terrible too, needing >60' to get all 6 on something you're chasing, or showing 60' broadside in a smokescreen. Blyskawica's is not as extreme as either, but she can get all 7 guns on from about 45' ahead through to less than 45' astern, has good arcs centrally and can always kite with 4 guns even directly headed away, vs 2 for the RN's units. In a chase you can still get 5 guns on target at 30'. Below, the clutter right in front of Cossack's aft turret (circled) offers an added explanation for the very poor angles of fire. One wonders if in practice, a clever sailor wouldn't have cut away some of that nonsense! That clutter would only interfere with the X turret, in game the secondary. Although getting rid of it would help there. Our ship is limited a deck lower, by the after deckhouse impinging on the turret. There's not much way around it. Y-turret is mounted on the main deck on the stern. The superstructure circled would obscure X-turret (which is now a dual-purpose secondary/AA mount). Y-turret is blocked by the presence of the low muzzle-blast shield that's meant to protect the Y-turret crew from the effects of X-turret's superfiring position. Cutting off the compass/searchlight platform would probably impair the operation of the ship significantly. It also looks like there's some K-guns and ready service lockers for the 102mm DP gun and 2 pounders up on that deck. 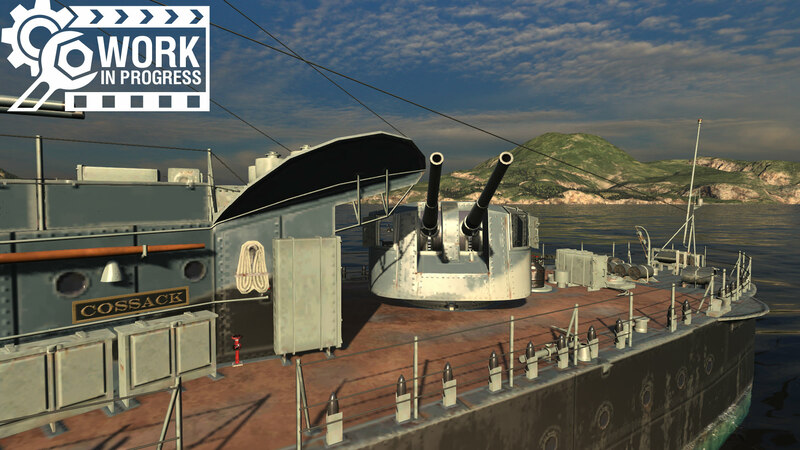 In real life, the K-Guns were probably more important to the ship than the 120mm main guns. Thankyou to yourself and @dseehafer and GM3D for this gem, I will just note that Blyz has only 3 guns (1x2&1x1) facing direct forward, not 4. Agreed, GM's arcs are awesome, coupled to her nimble design and small profile, a great little ship (aside those silly DWT). Blyz forward turrets. Once again, great catch Mouse, I will revise my initial post in accordance. Quick question, is Cossack's acceleration better or worse than, her UK stable peers? I haven't put any work into acceleration since Warspite 3.0. Neg, Khab out-accelerates Tashkent despite having a significantly worse power-to-weight ratio. I'd *like* to think they were clever about acceleration, but inside, I know they just slapped the same value on every ship and tweaked it here and there as necessary for balance.